Yesterday was the first day of the school holidays and we woke up to torrential rain so we decided to go and visit the Museum. Auckland residents get a free pass to the Museum so we we have been on a few occasions before, but were particularly excited to see the visiting Anne Frank exhibition. We had a quick look at the permanent exhibits, although not the volcano room which scares Lucy too much, and then made our way up the stairs to the War memorial and the Gallery housing the Anne Frank exhibition. As always looking at the exhibits from various conflicts around the world was a sobering experience. To see letters sent from soldiers to their families, to see what they wore and get a small insight into their experiences was humbling and made me hold Lucy’s hand a little tighter as we walked around the room. The Anne Frank exhibition told the famous story of Anne and the family and friends that hid together in the Amsterdam annexe. The room was busy but silent as each person navigated their way around and processed the story. Standing close to both of my girls as we read, I felt a powerful pang of gratitude that we live here and now, that we are safe and secure and able to embrace a freedom that Anne and her family could not. Of course, however, not everybody is as lucky as my little family is. So many people continue to face prejudice, persecution and discrimination and so the second part of the exhibition focussing on discrimination today was equally powerful and thought-provoking. 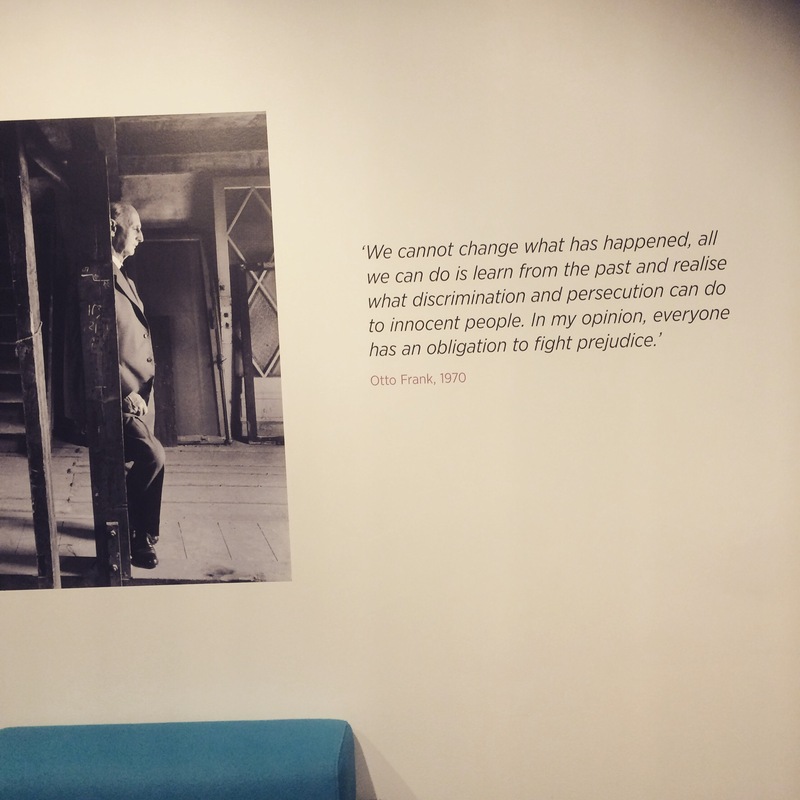 On the way out of the exhibition, I was struck by the words of Anne’s father Otto Frank that are printed on the wall. They resonate just as much today as ever and serve as a call to act against the prejudice and discrimination that still abound when people are identified as ‘other’.